It does sound a bit wrong to say that, plus I’ve only been to two funerals but please allow me to elaborate. My uncle recently passed away after a battle with cancer. I knew him as a warm-hearted and loving man, though I particularly knew him for his sense of humour and very much larger-than-life personality. But I never understood the extent to which he was appreciated and loved by so many. He needed the largest church in Hull to be able to hold the crowd of people that came to pay their respects. I guess there were around 400 people in the church, possibly 500. There were queues to get in, and passers-by were apparently overheard assuming that a celebrity had passed away. And in his own Winfield kind of way, he was a celebrity. Two caravan factories that he worked for shut down for the day so employees could attend. He hadn’t worked at either of them for many years – 5, maybe closer to 10 years. He was a proper northerner – very down to earth. He lived pretty much on the same road all of his life – for north Hull was the area, and more importantly, the people that he loved. And they loved him in return. I was consistently surprised about some of the stories I heard. Apparently when he owned a newspaper shop, by time it opened, there would often be 20 people in his front room drinking coffee and eating bacon sandwiches prepared for them. They would always be welcomed into his house – something replicated by his (and my dad’s) parents who always had an open door for those around. I like to think that I am quite pragmatic – being down south and away from events, it is easier to carry on with life. But the service was emotional. It surprised me. What really got to me is seeing other family members upset. Yeah, I half-cried. But the service wasn’t all tears and sadness. There were many moments of laughter too. For that is what my uncle would have wanted – he couldn’t stand morbid funerals. You may know that religion has no place in my life. However, I have always defended its ability to bring comfort and peace to many, and this was hugely emphasised on Friday. I was particularly taken by the vicar, who clearly had become a good friend with my uncle and the service was personal to him – he attended the wake afterwards and was still there when we left early evening. Not only did the vicar get his guitar out (sorry uncle for not doing the happy clappy thing) but then he de-robed to reveal a Hull City AFC shirt, which he did the rest of the service in. I deemed it inappropriate to photograph but the moment will stay with me forever. See, my uncle was a massive Hull City fan. It kind of runs in the family. I am truly delighted that he got to see them in an FA Cup Final, despite his health struggles. And I’ll always have an even greater appreciation for our manager, Steve Bruce, who often took the time out to speak to him, as my uncle would go down to watch training. My uncle had explained his scenario to him, and they had become quite friendly. Not that you would expect anything else from someone my uncle had spoken to! To be leading a major football club and yet still have time for the ordinary man is heart-warming, and I know how much my uncle appreciated it. There was one particularly funny story told at the funeral, and I remember being at the game and wondering what the heck my uncle was doing on the pitch at half-time. He was entering a competition to win a car. There was a large wooden frame of a tiger on the pitch, and you had three attempts to firstly kick the ball through the large hole – which was relatively easy, then after that you had to kick the ball through the small hole – the eye of the tiger. 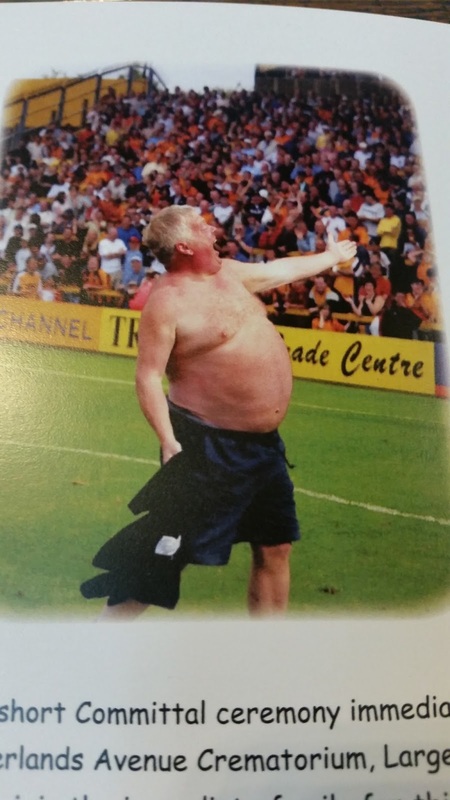 Instead, he hit the first ball straight through the small hole, and then ran round the pitch with his shirt off, belly fully exposed (quite some belly…he did once get stuck in a water slide on holiday) thinking he had won the car, with the crowd chanting “Who ate all the pies”. I expect that the story meant far more to him than the car that he didn’t win. The wake afterwards saw a lifting of spirits, and a fair amount of beer drunk. There were bacon and sausage sandwiches for all. No room for salad-queens. It was heart-warming to see so many people vaguely connected to the family – like the couple who used to babysit my uncle and father, whom I was particularly taken with. There were many stories told, particularly by my dad, who was in good form and even towards the end started a sing-song with “There’s Only One Ozzy Winfield”. True Winfield. Which brings me onto my point. I’m not even sure if I should really be writing about family funerals on a public blog, but if you know me well enough then you’ll have been expecting me to write about it. The overwhelming feeling I had by the end of the day was a real pride to be a Winfield. It was a day where I fully understood what being a Winfield was all about – being warm, generous, funny, loyal, honest – an entertainer, a listener, a story-teller. Occasionally an idiot. Some of those I do well…others not so well. I was also proud to be from Hull, albeit very secondary to being a Winfield. I am not sure you would replicate that kind of community and kindred spirit in Reading/Bracknell. It was an emotional day but yet looking back and reflecting nearly a week on, I can reflect on my memories, not just of that day, with considerable warmth and appreciation. So, lost for words now, I will just say RIP Uncle Ozzy. My favourite ever trade unionist. And the last thing he ever said to me? “Get your bloody hair cut”.